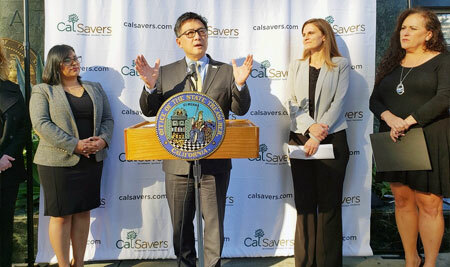 SAN DIEGO, CA – At a launch event in San Diego today, in front of small business leaders, community partners, and Californians ready to take control of their retirement security, California State Treasurer John Chiang and State Assemblymember Lorena Gonzalez kicked off CalSavers — a new statewide retirement savings program destined to empower 7.5 million California workers, currently without access to a workplace retirement program, to start saving for their golden years. In San Diego County, more than 16,000 employers and more than 338,000 employees are eligible for the retirement savings program. Today’s event is one of five being held statewide this week to launch the CalSavers program; the others being held in Los Angeles, Fresno, Sacramento and San Francisco, respectively. “Registering was easy and the platform was very user friendly and easy to navigate,” said Victor Barajas, human resources manager at San Diego-based Integrated Microwave Corporation, one of the pilot employers already registered for CalSavers.